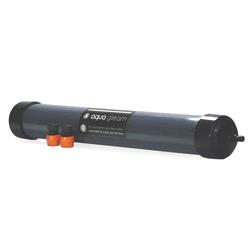 Aqua Gleam 30ppm De-ionising Water Filter - 30"
Water at this purity level will provide good spot-free results, making light work of the washing process as there's no need to chamois afterwards. In areas with particularly hard water it may be preferable to use a 30ppm filter rather than the 0ppm filter in order to prolong filter life. Water at this higher level of purity will provide the best possible results and meets the requirements of the most exacting users. We have been using the Aqua Gleam Filter to wash the aircraft (Wiltshire Air Ambulance) for the last 6 months and have been very impressed with the results. The aircraft always looks clean and shiny after using the product and we never have to use a chamois to dry it off after washing, as it now dries without leaving streaks or marks on the paintwork and glass.